We Care for Your Family. Great Eye Care Begins with Regular Eye Check Ups. 1st Blade Less Cataract Surgery in North India. Get Freedom from Glasses with 100% Blade Free Lasik Technology. BLADELESS, STITCHLESS, PAINLESS, INJECTION LESS CATARACT SURGERY. Fix Your Cloudy Vision With Safe Cure. More than 10 lakh satisfied Patients. Experience the latest & safest in laser specs removal. Sharpest Vision. No Pain. It is NABH accredited and is owned by Dr. S. Bharti, one of India's leading Ophthalmologist. Bharti Eye Foundation was established in 1985 and ever since it has been progressing in the field of technology in medicine. Their sole aim is to treat patients with the latest technology of the time in eye care. 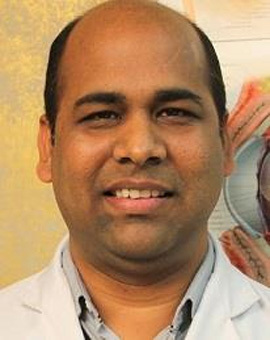 With the same motive, Dr. S. Bharti (Medical Director and Senior Consultant, Ophthalmology) has strived for the last 35+ years, and has possesses the most advanced ophthalmic equipment. The list does not end here; Bharti Eye has various other procedures which are used for the patients. Blade free lasik laser vision correction with Z-Lasik 1K is the most advanced Wavefront Lasik technology. It incorporates a combination of 1 KHz Zeimer Femto- second laser and NIDEK "Quest" Exclaime with 1000 Hz Eye Tracking and Iris-registration giving the most accurate results. The combination is fastest andtake very short time , to track and correct the eye powers(All-Myopia Hyperopia, Astigmatism ) as well as the correction of near glasses(Prebyopia)with most accurate results. Dr.Bharti has the distinction of performing the FIRST LASIK IN DELHI. Bharti Eye Hospital is one of the most reliable names in the field of ophthalmology and eye procedures. Our state of the eye centre in Greater Kailash & Patel Nagar, Delhi, India offers wide range of services. We offer the best eye treatments for simple and complex surgeries. It is one of the leading centres for eye care in the country, based in NCR. Being one of the best eye hospitals in Delhi, Bharti Eye has innumerable success stories. With that, it has developed a reliable name in the field of eye care procedures. The highly skilled team at Bharti Eye is coupled with equally capable and trained ancillary staff which is backed by the international standard technology comparable to the best worldwide. Why Choose BHarti Eye Hospital? A recognised medical facility by the NABH, it is also part of various government initiatives like the Central Government Health Services (CGHS), MCD, ECHS, and Directorate of Health Services (DGHS). These recognitions assure quality facilities and procedures. Our doctors have a vast experience (35+ Years) of over 100000 surgeries and are trained in the use of latest technology. The center provides a complete spectrum of eye care services like: 1.Femto Laser cataract surgery 2. All types of Lasik surgery 3. Cornea transplant 4. Retina surgeries 5. Glaucoma treatment 6. Squint and Paediatricophthalmology treatment under one roof. All procedures are done by a highly motived team with an experience of over 100000 cataracts, 100000 LASIK and 50000 other surgeries. To be the most valued eye care hospital for our patients, employees and stakeholders through progressive technology, professional ethics and an evolved patient experience. Alongside the recognition, its wide range of services is a sign of continued progress and effort. Not only are the services numerous, but they are also affordable as well. The team of doctors in profoundly experienced, with over 35 years of experience along with training with the latest instruments and procedures. With this unmatched range of services, it has built strong since the last three decades. It cannot be denied that the foundation has developed a strong reputation and can be called the top eye hospital in Delhi. The exclusive facilities of the eye centre are at par with not only those of hospitals in Delhi, but of world-renowned hospitals as well. Bharti Eye Hospital has acquired the First LenSx (Alcon USA) Femtosecond Laser for Cataract Surgery in Delhi. LASIK is the most popular laser vision correction procedure in the world today. LASIK is a two stage procedure. The cornea unit consists of well-trained corneal surgeons and is well equipped with instrumentation and technology..
Glaucoma is a group of disorders in which the main risk factor is high fluid pressure within the eye. It consists of special cells that convert light into electrical impulses. These electrical signals are sent to the brain .. The capital of India homes many of the best eye hospitals in the country which is equipped with all latest facilities and renowned eye specialists. The eye hospitals in Delhi help their patients with best therapeutic care and always strive hard to meet the needs of every patient. Phacoemulsification specialist in south Delhi and elsewhere prescribe few screening tests before the surgery to ascertain the general health of the patient. It is advisable to get the screening tests done before the surgery. For a patient suffering from cataract, colors of the world look dull and muted. Cataract is a natural and gradual phenomenon of an eye when the natural lens of the eye gets clouded. This results in blurred vision for the patient. "Dr. Bharti is amazing! My sister, my dad and I all went to him for LASIK and PRK. He is the BEST, hands down. I recommend Dr. bharti to everyone who is considering LASIK." ​"The procedure was quick and easy, recovery time was extremely fast and I would recommend getting Cataract from Dr. Bhupesh Singh to everyone! I'm just sorry I didn't get Cataract sooner." "I love coming here because staff here is extremely knowledgeable. From the front desk, to the techs, to the doctors, everyone does their jobs extremely well and makes an appt go smoothly. I've seen Dr. S. Bharti and Dr. Bhupesh Singh and both are great." "I had my Lasik surgery 4 days ago and I'm still amazed that I can see! I had bad eyes for about 18 years and 10 of those years I was almost legally blind. To be able to see crystal clear is such a beautiful feeling it makes me want to cry. Dr. S. Bharti has changed my life."